Jewish convert to Islam in the time of Mohammed; died 663. According to the Moslems, he was one of the most important Jewish personages in the history of Mohammed's career at Medina, owing to the fact that he was converted to Islam. His reputation among believers is so great that the standard works on Moslem tradition have special chapters devoted to the "High Qualities of Abdallah ibn Salam." Indeed, he is the prototype of Jewish converts to Islam, of whom there existed a small number during Mohammed's lifetime. He belonged to the tribe of the Banu Ḳainuḳa'a. His name was Al-Husain, and he claimed to be a descendant of Joseph. After his conversion he assumed the name of Abdallah ibn Salam. There are several more or less fanciful stories about his conversion, all of which are unreliable, because they describe him as a Moslem soon after Mohammed entered Medina, whereas he was not converted till eight years later, or two years before Mohammed's death. The share which even modern scholars believe Abdallah to have had in the production of the Medinian part of the Koran is, therefore, illusory, because at this period the work was, in the main, completed. 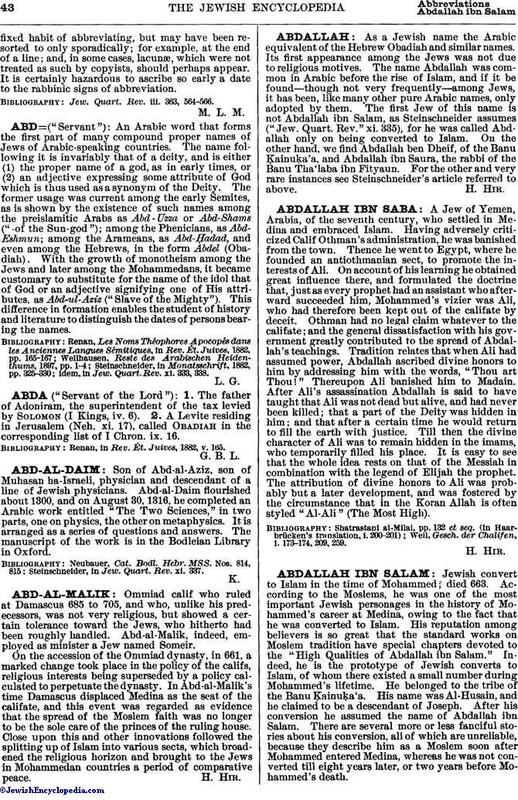 Abdallah was, however, able to provide Mohammed during this period with information from Jewish sources, which subsequently reappeared in the form of sayings attributed to Mohammed. Therefore he may be regarded as one of the fathers of the Hadith, and especially of several important legends which tend to glorify Mohammed's youth. 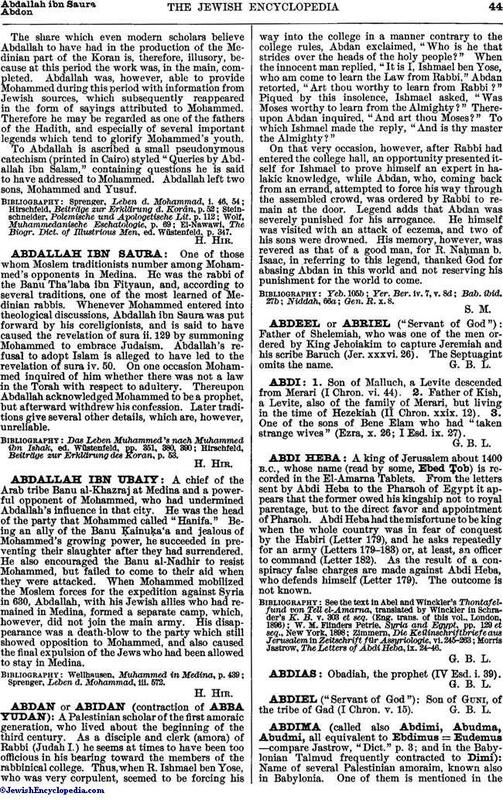 To Abdallah is ascribed a small pseudonymous catechism (printed in Cairo) styled "Queries by Abdallah ibn Salam," containing questions he is said to have addressed to Mohammed. Abdallah left two sons, Mohammed and Yusuf. El-Nawawi, The Biogr. Dict. of Illustrious Men, ed. Wüstenfeld, p. 347.